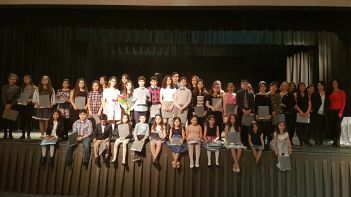 The Armenian General Benevolent Union of Toronto and AGBU Performing Arts Department have prepared many cultural surprises for its audience this year. On Sunday November 4th, many music lovers were once again gathered in the Babayan Auditorium of AGBU Alex Manoogian Cultural Centre. 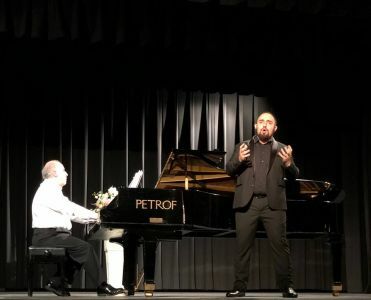 This time, they gathered to witness a performance by rising Armenian opera starts Tigran Ohanyan (tenor) and his newlywed wife Marieta Korukhchian (soprano), as well as the accomplished pianist Gregory Chaverdian. The performance was dedicated to the memory of their beloved Pedagogue and professor of Yerevan State Conservatory Rafael Akopyants. Many of Professor Akopyants’ students sing on the biggest opera stages all over the world, and represent an homage to a truly great teacher, who used to repeat: “My students are my success“. As Gregory Chaverdian mentioned before the concert: “Each of his lessons was as an inspirational pedagogy masterclass. The significance of Rafael Akopyants’ remarkable life and accomplishments in music require much longer time to distill. I am deeply honored to introduce today to Canadian audiences two of his last students – Tigran Ohanyan and Marieta Korukhchian”. At the opening of the concert, Ms. Isabelle Davidian invited the audience to honor the memory of the legendary French chansonnier of Armenian origin Charles Aznavour, who passed away on October 1st 2018, with a minute of silence. Ms. Davidian then talked about the AGBU Performing Arts and AGBU’s mission to support Armenian art and culture as well as to promote its talented young artists. She welcomed concert’s sponsors and the honorable guest Nurhan Arman, the conductor of Sinfonia Toronto, one of the Canada’s finest chamber orchestras. Upon the conclusion of this warm opening, performers were invited to the stage where the intrigued audience met them with excitement and anticipation. Musicians performed a compelling mix of musical masterpieces – arias, songs, romances, and duets. Listeners were particularly excited for significant emphasis on Armenian composers in the repertoire that evening – they enjoyed such gems of Armenian music as Le le yaman by Komitas, famous romances by Eduard Abrahamyan and Edvard Mirzoyan, arias and duet from Anush and David Bek operas by Armen Tigranyan. Performances were rich and notable: singers successfully combined graceful lyricism with intense drama, that is a cornerstone in Armenian music. In addition to music by Armenian composers, performers also offered arias by Verdi, Gunod, Lehar and Dvorjak, and songs by Lara, Puccini, and Leoncavallo. Soprano Marieta Korukhchian was particularly noticeable for her lyrical tone that soared beautifully over the piano accompaniment in Moon Aria of Dvorjak (Rusalka) and in the Romance of Rimsky Korsakov. Marieta was born in Armenian city Spitak, the epicenter of the devastating earthquake of 1988. On that day, the town of Spitak was completely destroyed within 30 seconds. Marieta’s parents with 4 children were faced with the problems of finding a place to live and finding a new job. They decided to leave Armenia and start a new life in Russian city of Irkutsk. Mrs. Korukhchian graduated from Irkutsk Music College after Frederic Chopin and worked in Irkutsk Dramatic Theatre till 2013, when she returned to Armenia and continued her vocal studies at the Yerevan Komitas State Conservatory. 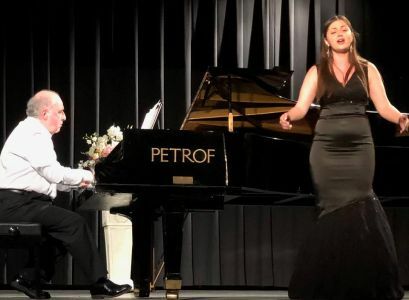 Marieta and Tigran performed glorious and uplifting duets – Ernesto de Curtis, Anush-Saro Duet from A. Tigranyan’s Anush opera, and famous Libiamo Duet from La Traviatta Verdi. Tigran’s intense tone and eager personality contrasted with Marieta’s rather clear and calm performance. The two voices blended in a magical way, whether singing in harmony and unison or as call and response. The pair emitted passion and harmony. But if anyone can be said to have stolen the show, it’s Tigran Ohanyan and his solo appearances. Tigran’s voice was clear, powerful, flexible and dramatic. He felt each song and turned it inside out. Tigran performed with such inspiration, he made every word sound important and made the listeners feel as if he was singing straight to them. Everyone in the audience noticed that Tigran, while singing with considerable warmth, never pushed his voice. He demonstrated impressive consistency and control throughout his entire range. Possessing an exceptional singing line, Tigran was able to combine spectacular power with the incredible ability to smoothen out sounds and breathing. More than the technical aspects of his voice, the musicality behind it, his ability to tell a story, and his desire to communicate with the audience made the program especially memorable. Tigran was developing his talent from early childhood, taking voice classes in Spendiaryan music school, then graduating with honors with Master’s degree from the Yerevan State Komitas Conservatory. Tigran was a grandnephew of Professor Rafael Akopyants, who helped Tigran acquire important vocal techniques and taught him during all Conservatory years. Tigran, despite his young age, already appeared in many highest ranked stages of the opera world – Benjamin Britten Theatre in London, Bolshoy Theatre in Moscow, Verdi Theater in Italy. He is also a winner of many international vocal competitions, and nowadays is a member of Young Artist Opera Program of A. Spendiaryan Academic Theatre of Opera and Ballet in Yerevan, Armenia. And that is just the beginning of his career! Alongside the rising stars was also the curator of the musical program for that night, the exceptional pianist Gregory Chaverdian. As the famous saying goes: “accompanists are the unsung heroes of the classical music world“. Truly, Gregory created a virtual telepathy between him and the singers, he used the piano as a reservoir of colour that needed to create the infinite emotional variety required in every song. The audience witnessed him balancing sound level, momentarily adjusting for changes in the performance and to singers’ breathing. The invisible connections that bind his fingers and singers’ voices were amazing: “Gregory built up a kind of musical radar, delivered such a collaborative alchemy that any professional soloist would struggle to create”- pointed out a professional musician after the concert. Gregory, a graduate of Yerevan State Komitas Conservatory, is a dedicated pedagogue, outstanding performer, and an incomparable accompanist. All of these musical paths have brought to him international recognition. He is a sought-after piano professor who is constantly invited to Masterclasses and festivals in Europe. Gregory is extremely busy in Montreal with different projects, concerts and competitions, that bring more and more prizes to his students. Despite his busy career, Gregory has never stopped promoting Armenian artists and Armenian music, and Toronto music lovers are thankful to him for his huge help in organizing this concert. “There is not much interest towards the opera genre all over the world and this initiative is aimed to remind what a great opera potential Armenia has“, proudly mentioned Gregory after the concert. Perhaps it was the plangent vocal and piano tones and yearning emotions that captivated the ears and hearts of virtually all listeners. In response to the extremely vociferous and prolonged applause and enthusiastic standing ovation the performers returned for just one encore to perform one of the best-known tenor arias – Nessun dorma, from Puccini’s opera Turandot. This performance expressed emotion, rich vocalism and energy in one single aria. It was perfect!